As we turn the calendar page and look ahead at what 2019 might look like for outdoors enthusiasts, it’s safe to say the goings-on in Augusta will provide plenty of news in the coming months. The Maine Department of Inland Fisheries and Wildlife will get a new commissioner — Judy Camuso has been nominated to the post — and that changing of the guard will likely produce a new slate of priorities. Add in an effort to add protections to wild and native trout, and a potential change in the way the state manages its bear herd, and there are plenty of issues to keep track of. First up, after eight years of the Paul LePage administration, we’ll have a new governor. And that means a new slate of commissioners of various branches. Camuso, if confirmed, will succeed Chandler Woodcock, who served eight years as DIF&W commish. What should her priorities be? Camuso said she’d be happy to talk after the confirmation process is complete sometime in January; in the meantime, a couple of outdoors insiders were willing to offer up some suggestions. James Cote, who serves as legislative liaison for the Maine Trappers Association and led the group that helped defeat a 2014 bear hunting referendum in Maine, shared a few fisheries, trapping and landowner relations concerns that Camuso might want to address. “I would like to see more effort in the way of identifying land open to hunting fishing and trapping, and perhaps when appropriate, the acquisition of public land for hunting/fishing/trapping access as well,” Cote wrote in an email. As for trapping, Cote said the MTA has worked hard to increase trapping opportunities, and wants that work to continue. And when it comes to fisheries, Cote had an idea that would mirror the department’s efforts with moose and deer. “There is no question that we need to start hiring species specialists like we do with wildlife, to work more directly with species of concern, like brook trout, salmon, etc.,” he wrote. Don Kleiner, a longtime Maine guide who is the executive director of the Maine Professional Guides Association, said his board of directors has not yet met to discuss Camuso’s nomination, so he couldn’t speak for the organization at this time. He did agree to speak as a private citizen about priorities the department may want to consider. Finding a funding solution for the department will be one key, he said. Kleiner, who worked for the department in the 1990s and early 2000s as the director of information and education, said a more “public-facing” communications strategy would help the DIF&W spread the word about the work that’s being done and the reasons certain decisions are being made. And he said that in some cases, the department will have to take different management priorities than it does now. 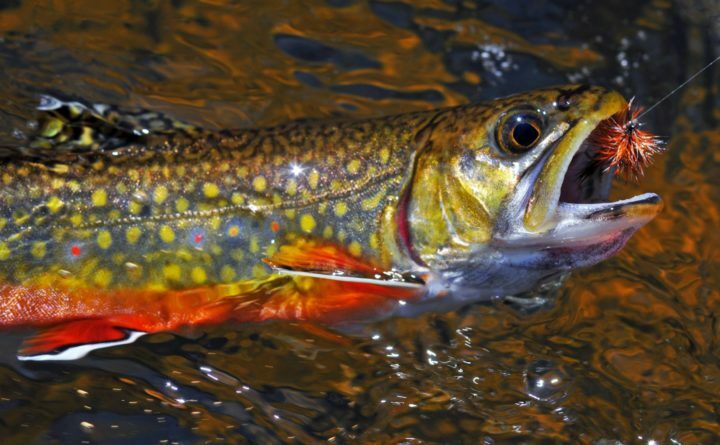 When it comes to fisheries, Maine is sitting on a true gem: Its wild and native trout populations, which are unmatched in the lower 48 states. The department is considering changing some rules that would make “no live fish used as bait” the default general law in the state’s northern zone. That doesn’t mean that live bait wouldn’t be used in that region, but that the use of live bait would require a special rule designation. The move wouldn’t lead to the abolishment of live bait on lakes where the bait is currently allowed for ice fishing, but would more firmly state that the protection of wild and native fish is important. Bob Mallard, the national vice chair of the Native Trout Coalition, said he looks forward to continuing the organization’s work for native fish in Maine in 2019. In 2018 the group posted signs on more than 125 “State Heritage Fish” waters, letting anglers know about special rules in place to protect trout and charr. And finally, the DIF&W has issued a request for proposal that may redefine how black bears are managed here in Maine. The request seeks proposals to develop a bear population model that would “inform the management of black bears,” according to The Associated Press. The state’s bear management model and its hunting practices have been challenged twice over the past 15 years, with two referendums that would have ended the use of bait, hounds and traps defeated at the ballot box. The request for proposals promises to draw various plans that may or not be acceptable to the DIF&W, hunters, or those who support the abolishment of certain practices, and is worth watching.